All modulators and SSB upconverters require that at least one of the input frequency bands (carrier or modulation) has sufficient power to turn on the semiconductors. All modulators yield a frequency spectrum that utilizes both sidebands on either side of the output suppressed carrier. 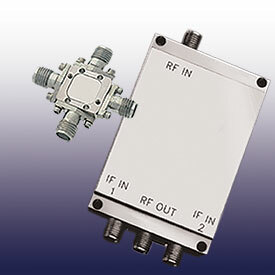 SSB upconverters, however, employ an internal IF 90° hybrid to yield only one RF sideband output. This is offset above or below the input LO by the IF frequency. when the modulation input to RF output must be linear (low harmonics). A typical application is for digital QPSK with cosine shaped pulses (for minimum bandwidth). Many SSB upconverters also require input-to-output signal linearity, thus requiring LO drive. 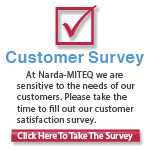 L3 Narda-MITEQ maintains dedicated engineering resources to modify our standard designs in support of custom-generated specifications. All modulator products are backed by L3 Narda-MITEQ's 3-Year Warranty and most are available as RoHs Compliant components.